MARUKYU BRANDS WEB SITE renewal. The reason for being able to catch fish is here. Making baits that can catch fish is MARUKYU's duty. The first step to achieve this is to understand the fish. 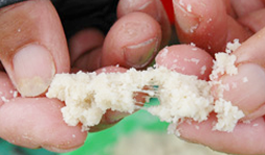 We choose ingredients that excite the fish and think carefully about the combination to match each bait. Their environmental impact is minimal, so you can use our baits without concern. Everything is in perfect order to complete MARUKYU's baits. Exporting Japanese quality to fishing enthusiasts around the world. first have a look here. Copyright © 2014 - MARUKYU CO.,LTD. All Rights Reserved.